New cookbook from the co-owners and chefs at Hell’s Backbone Grill in Boulder shares recipes, stories and landscape photos. (Scott Sommerdorf | The Salt Lake Tribune) Jen Castle, left, and Blake Spalding, center, owners of Hell's Backbone Gril... (Scott Sommerdorf | The Salt Lake Tribune) Blake Spalding, co-owner of Hell's Backbone Grill in Boulder, signs a copy o... (Scott Sommerdorf | The Salt Lake Tribune) Blake Spalding, co-owner of Hell's Backbone Grill in Boulder, signs a copy o... (Scott Sommerdorf | The Salt Lake Tribune) Blake Spalding, co-owner of Hell's Backbone Grill in Boulder, shows a double... (Scott Sommerdorf | The Salt Lake Tribune) Blake Spalding, co-owner of Hell's Backbone Grill in Boulder, leafs through ... (Scott Sommerdorf | The Salt Lake Tribune) Jen Castle, co-owner of Hell's Backbone Grill in Boulder, hands a copy of th... (Scott Sommerdorf | The Salt Lake Tribune) Blake Spalding, co-owner of Hell's Backbone Grill in Boulder, hugs friend Ma... Dip from This Immeasurable Place, a new cookbook from Hell's Backbone Grill in Boulder Utah Jen Castle and Blake Spalding recently released This Immeasurable Place, their second cookbook from Hell's Backbone Grill in ... Winter at Hell's Backbone Grill in Boulder Utah Carrot Soup from This Immeasurable Place, a new cookbook from Hell's Backbone Grill in Boulder Utah Shirred eggs from This Immeasurable Place, a new cookbook from Hell's Backbone Grill in Boulder Utah This Immeasurable Place is the second cookbook from the co-owners and chefs at Hell's Backbone Grill in Boulder, Utah. 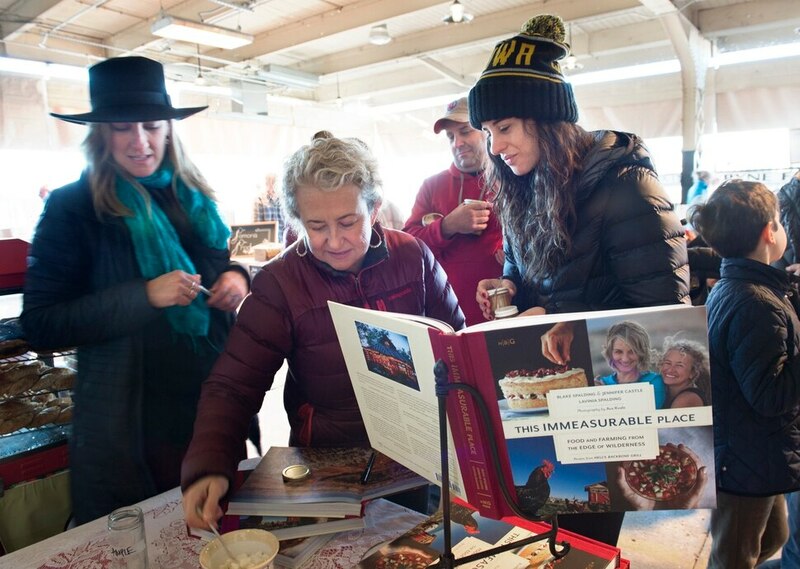 (Scott Sommerdorf | The Salt Lake Tribune) Jen Castle, left, and Blake Spalding, center, owners of Hell's Backbone Grill in Boulder, sign copies of their new cookbook, This Immeasurable Place: Food and Farming from the Edge of Wilderness, at the Winter Market at the Rio Grande Depot, Saturday, December 9, 2017. (Scott Sommerdorf | The Salt Lake Tribune) Blake Spalding, co-owner of Hell's Backbone Grill in Boulder, signs a copy of the new cookbook, This Immeasurable Place: Food and Farming from the Edge of Wilderness, December 9, 2017. (Scott Sommerdorf | The Salt Lake Tribune) Blake Spalding, co-owner of Hell's Backbone Grill in Boulder, signs a copy of the new cookbook, This Immeasurable Place: Food and Farming from the Edge of Wilderness, for Margie Batson, December 9, 2017. (Scott Sommerdorf | The Salt Lake Tribune) Blake Spalding, co-owner of Hell's Backbone Grill in Boulder, shows a double truck photo from the new cookbook, This Immeasurable Place: Food and Farming from the Edge of Wilderness, December 9, 2017. (Scott Sommerdorf | The Salt Lake Tribune) Blake Spalding, co-owner of Hell's Backbone Grill in Boulder, leafs through the new cookbook, This Immeasurable Place: Food and Farming from the Edge of Wilderness, for Katherine Stack at the Winter Market, December 9, 2017. 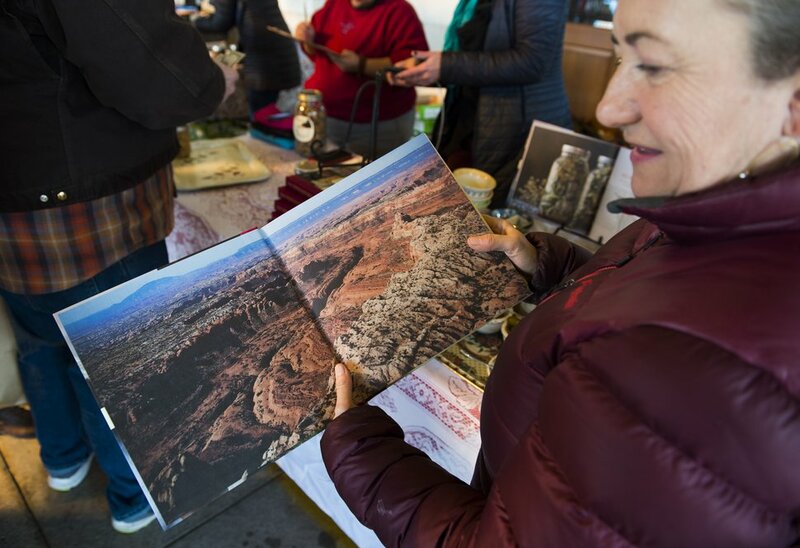 (Scott Sommerdorf | The Salt Lake Tribune) Jen Castle, co-owner of Hell's Backbone Grill in Boulder, hands a copy of the new cookbook, This Immeasurable Place: Food and Farming from the Edge of Wilderness, to Margie Batson at the Winter Market at the Rio Grande Depot, Saturday, December 9, 2017. (Scott Sommerdorf | The Salt Lake Tribune) Blake Spalding, co-owner of Hell's Backbone Grill in Boulder, hugs friend Mary Brown Malouf at the Winter Market at the Rio Grande Depot, Saturday, December 9, 2017. Dip from This Immeasurable Place, a new cookbook from Hell's Backbone Grill in Boulder Utah Jen Castle and Blake Spalding recently released This Immeasurable Place, their second cookbook from Hell's Backbone Grill in Boulder, Utah. They call it their love letter to the recently dismantled Grand-Staircase Escalante Monument. Winter at Hell's Backbone Grill in Boulder Utah Carrot Soup from This Immeasurable Place, a new cookbook from Hell's Backbone Grill in Boulder Utah Shirred eggs from This Immeasurable Place, a new cookbook from Hell's Backbone Grill in Boulder Utah This Immeasurable Place is the second cookbook from the co-owners and chefs at Hell's Backbone Grill in Boulder, Utah. Just as Blake Spalding and Jennifer Castle, co-owners and chefs at Hell’s Backbone Grill in Boulder, started mailing the 1,700 pre-orders for their new cookbook, “This Immeasurable Place,” President Donald Trump was preparing to dismantle the Grand Staircase-Escalante National Monument. The 265-page book — part recipes, part stories, part glossy photographs — was written as a “love letter to the monument,” which serves as the backdrop to the award-winning Utah restaurant and the reason for its existence and popularity. (Scott Sommerdorf | The Salt Lake Tribune) Blake Spalding, co-owner of Hell's Backbone Grill in Boulder, shows a photo from the new cookbook, "This Immeasurable Place: Food and Farming from the Edge of Wilderness," Dec. 9, 2017. On Dec. 3, during a whirlwind trip to Salt Lake City, the president shrunk the 1.9 million-acre Grand Staircase-Escalante into three smaller monuments covering about 1 million acres. He also split the 1.35 million-acre Bears Ears National Monument into two smaller areas that together comprise about 202,000 acres. “When we started the cookbook, we didn’t think anything would happen to the monument,” she said. Fast-forward five years and the business owners are now part of a lawsuit filed by Grand Staircase Escalante Partners, one of five legal actions that have been filed so far to stop the changes. "This Immeasurable Place" is the second cookbook from the co-owners and chefs at Hell's Backbone Grill in Boulder, Utah. Hell’s Backbone Grill — which just ended its 18th season — opened three years after President Bill Clinton made the surprise announcement that turned Grand Staircase-Escalante into a national monument. At the restaurant, named for one of the area’s stunning geological features, “the food reflects the place” thanks to a 6-acre farm that provides a bounty of organic produce, eggs, herbs and flowers that garnish every plate. That sense of place resonates with guests, making Hell’s Backbone Grill one of Utah’s most decorated restaurants with dozens of local awards and mentions in national publications from Bon Appétit to The New York Times. Each year the restaurant harvests some 20,000 pounds of food on its farm and several thousand more pounds of fruit from around the valley;much of it is pickled, frozen and preserved. The owners also work with area ranchers and farmers to buy grass-fed beef, lamb and anything else they don’t grow themselves. The restaurant is now closed for the winter, but will reopen in March, 2018. “This Immeasurable Place: Food and Farming From the Edge of Wilderness” showcases 70 of the restaurant’s favorite creations, from the juniper lamb posole and braised beef with green chiles and marjoram to “Dreamy, Creamy, Hot and Steamy” oatmeal with caramel apple compote and pumpkin-apple soup. While the first 3,000 cookbooks came off the presses in late November, the stash has been quickly depleted by 1,700 in pre-orders. 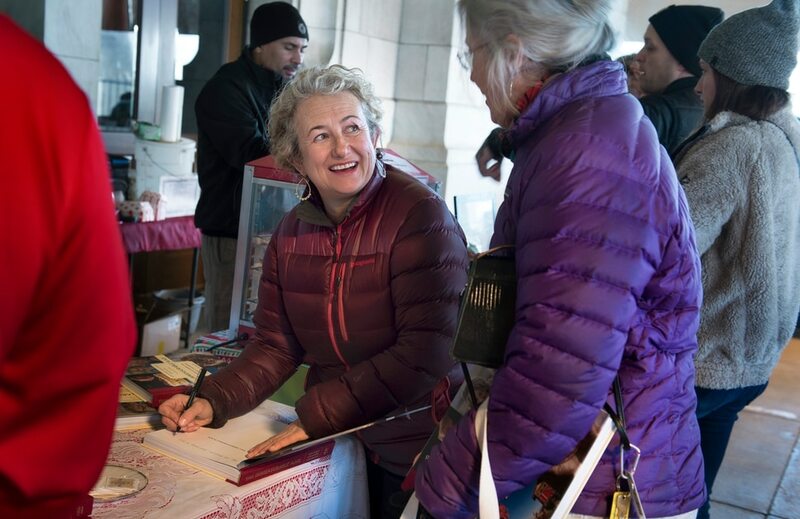 Spalding and Castle will be selling and signing books in Salt Lake City this weekend at Ken Sanders Rare Books, The King’s English Bookshop and the Winter Market at Rio Grande. (See box.) They should have enough books to last through the holidays, but already have contacted the publishers about a second printing. Books are $40 each and also are available online. (Scott Sommerdorf | The Salt Lake Tribune) Blake Spalding, co-owner of Hell's Backbone Grill in Boulder, signs a copy of the new cookbook, "This Immeasurable Place: Food and Farming from the Edge of Wilderness," on Dec. 9, 2017. The new publication is different from their first cookbook. 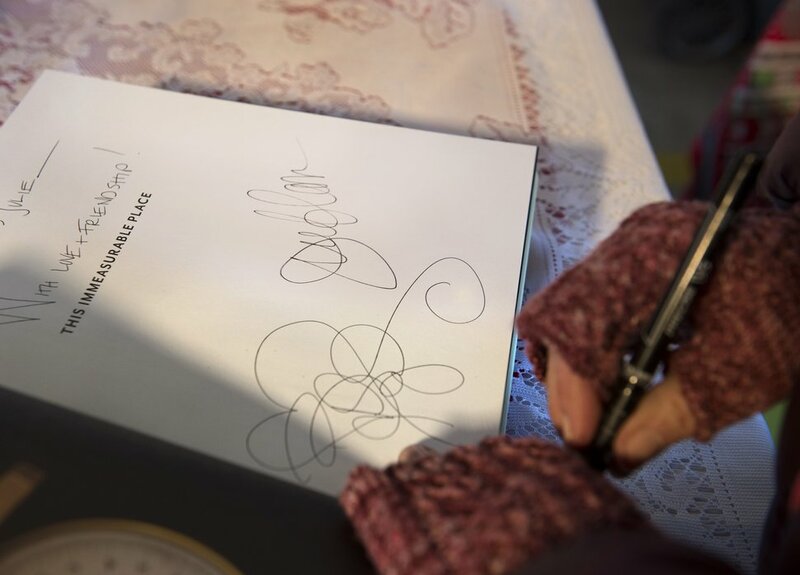 “With a Measure of Grace” — published in 2004 with the help of Lavinia Spalding, Blake’s sister — took a “micro” look at the relationship between the restaurant and the local Boulder community. “It’s more about what it was like to start our Buddhist-based restaurant in an LDS town,” said Spalding. “An Immeasurable Place” also includes Lavinia as an author and features images by photographer Ace Kvale. The title, with its intended nod to the first book, alludes to the four Buddhist virtues or “immeasurable qualities” that lead to happiness. Saturday, Dec. 16, • 10 a.m. to 2 p.m., Winter Market at Rio Grande Depot, 300 S. Rio Grande St.